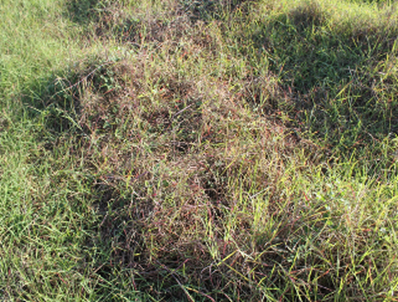 Pasture dieback is a poorly understood condition that causes unthrifty growth and death of otherwise very productive pastures. 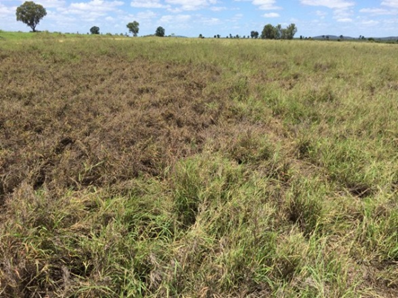 The condition has been identified in a range of sown and native grasses in north Queensland, Mackay-Whitsunday, central Queensland, Wide Bay-Burnett and south east Queensland regions. The condition causes large losses in beef production and is a major concern for the Queensland grazing industry. The occurrence of dieback in pastures has accelerated in recent years, however it is not a new phenomenon; dieback has been reported since the early 1990s in central Queensland buffel grass pastures. What is the current area affected by pasture dieback? How is pasture dieback different from pasture rundown? What can be done about pasture dieback? Death of plants in patches that are subsequently colonised by broadleaf weeds, legumes and (rarely) annual grasses. 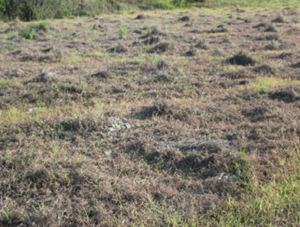 Pasture dieback has been observed across a range of soil types, landscape locations (ridges, gullies, gentle and steep slopes) and grass species. Stock avoid grazing affected areas. The loss of forage production and consequently carrying capacity has a major impact on enterprise productivity. Bisset creeping bluegrass showing initial symptoms of dieback, note the reddening of leaves in high biomass clumps. Bisset creeping bluegrass fully affected by dieback. Native pastures such as black speargrass, forest bluegrass and Golden beard grass. Approximately 120 landholders have reported pasture dieback on their properties, and about 35,000ha of pastures are known to be affected (see table below). However, the entire 35,000ha is not completely affected, as generally patches of pasture are affected across this area. The actual area affected is likely to be significantly higher than this due to not all reports being captured by DAF. Also, many graziers are unfamiliar with the disease and therefore don’t realise they have pasture dieback, and anecdotal reports indicate some graziers have been reluctant to report affected pastures. Pasture rundown is the reduction of pasture growth over time due to the tie-up of soil nutrients (primarily nitrogen). Pasture performance (growth and quality) gradually reduces over time, however plants remain alive, and large areas can be uniformly affected, for example, whole paddocks, properties and districts. Conversely, pasture dieback is expressed as unthrifty or dead patches throughout relatively well grown pasture (in more severe cases whole paddocks can be impacted), and these patches can occur very quickly, for example, during one summer season. Ultimately, plants in these patches die, and these dead areas can be subsequently colonised by broadleaf weeds and legumes. Buffel grass pasture affected by dieback. 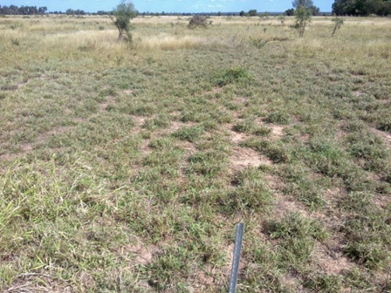 Note the dead patch (left of photo) surrounded by well-grown buffel grass without any other grass species. Buffel grass pasture affected by rundown. Note the low biomass of the buffel grass and the prevalence of other grass species, especially Indian couch. Past research has proved inconclusive in identifying the cause(s) of the condition. Without knowing what the cause is, it is difficult to determine effective management strategies that reduce the impact of, or control the condition. Some graziers are implementing a range of techniques to restore pasture productivity, such as burning, fertilising, renovating (only), renovating and re-seeding, spraying on a range of different chemical or biological formulations and changing grazing management. At this point in time none of these techniques have proven to be effective at controlling pasture dieback. A word of caution; many chemical sprays, for example, fungicides and insecticides are not registered for use on pastures in Queensland, so be aware that any off-label use of a product is illegal. What is DAF doing about the issue? Since mid-2015 DAF staff have conducted site visits, soil and plant sampling and laboratory analyses to better understand the problem. The DAF team working on the issue include plant pathologists, agronomists and extension officers. Results to date have been inconclusive. In response to producer concerns and to provide an update on recent sampling and testing, DAF pasture scientists and beef extension staff held two forums in Biloela and Moura during March 2017. Feedback from the forums has given the DAF scientific team further insights into the scale and impact of the problem. It has also helped in planning the best way to determine the cause and appropriate management solutions. Stuart Buck, Senior Agronomist (Sown Pastures), based in Rockhampton, is working with the beef industry to develop a research project into the cause and management options of pasture dieback. Who can producers contact about pasture dieback? If you are concerned about pasture dieback please call DAF on 13 25 23, or visit your local DAF office to talk to a DAF extension officer. Meat & Livestock Australia (MLA) are asking affected graziers to fill out an online survey to report the occurrence of dieback. To take the survey visit the MLA pasture dieback survey page. Compiled by Stuart Buck (DAF Rockhampton) and Carly Johnstone (DAF Biloela).